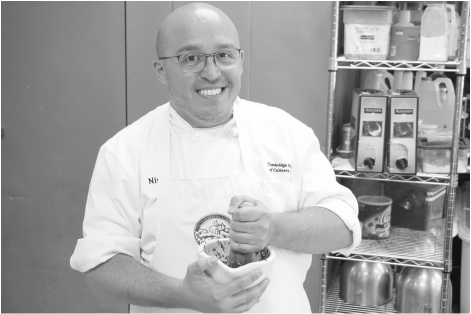 my name is Nino Barbalace, I am a personal chef, I am Sicilian, I live in Boston … and I love to cook! I grew up in Sicily and I got the passion for cooking from my aunt Gianna who raised me as a mother, who taught me the secrets of the kitchen, and also passed me her true love for cooking. I will remember forever the long Sundays spent at the dinner table eating the delicious food cooked by my aunt for our “typical” Sicilian extended family made of uncles and aunts, cousins, grandparents, great-aunts, and lots of friends. She made me understand that food is not just assembling ingredients together, it is more than that! She taught me that a recipe is “food for the soul”! That's why I chose that as the motto for my company. After earning a Master Degree and a PhD. in History and Conservation of Historic Heritage and after working many years in Academia, lastly as a post-doc at the Massachusetts Institute of Technology with a project on the energy retrofit of the Victorian row-houses of the Back Bay in Boston, I found myself seeking a change to work with food. The other thing I have ever truly been passionate about besides architecture. So I decided to leave academic life and dedicate myself full time to cooking. I decided to go back to School, this time to to get a formal education at the Culinary Arts. So I did it and I graduated from The Cambridge School of Culinary Arts and soon after I was working as a Personal Chef doing what I had always wanted to do in life. One of my clients I work for as a personal chef one day stopped by the (his) kitchen while I was cooking for him and said something that really surprised me and almost moved me to tears: “Nino, I love your food, but you know what I love the most? I love the passion you put in it, I can taste it in your dishes if that is even possible. It fills my heart and makes me feel at home”. He made my day. Well, he actually made at least my entire week! I truly hope I can cook for you someday and bring to your home the sweet-sour-spicy-colorful taste of Sicily!